Knowledge is the key to a successful career in real estate. At MGR, we take pride in our agents’ high level of proficiency. We consider it an important mission to provide continuous training. The better equipped our staff is, the better service we provide! Weekly staff meetings keep the staff up-to-date with current information concerning the real estate industry. Vital information is communicated, current events discussed, and production reviewed. Year round training provides the basic foundation required to build and develop a career that result in success for both the residential and commercial professional. 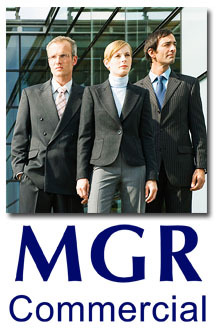 MGR offers comprehensive training in both residential and commercial real estate. Scroll down to learn more about our training programs! Classroom Training – This 13-week course provides the basic fundamentals to begin, build, and develop a thriving career in commercial real estate. Classes are hands-on with live instruction and designed to enable the trainee to apply what they’ve learned to start producing right away. Field Training – In addition to the classroom, each trainee is assigned a territory, a physical location in which to practice what they learn in class. As an important component of training, territories will usually generate the first commercial leads and contacts. Mentoring – Trainees are partnered with a senior associate who serves in two capacities: 1) As the expert in the deal, and 2) As the trainer. Intro to Commercial Real Estate An introduction to the commercial real estate – what to expect as you develop your career, and how to model success. Commercial Disciplines, Territories, and Terminology A lesson on the differences between brokering office, retail, industrial, multi-unit, mixed-use and land – otherwise known as disciplines or “areas of responsibility.” This class also discusses the importance of selecting a good territory – what to consider and what to focus, in relation to your “area of responsibility”, so that it will yield the leads and contacts you are pursuing. Terminology covers the definitions of the most commonly used terms in commercial real estate – “terms of the trade,” with the objective of learning how to speak the “commercial language” so that you are able to communicate professionally with commercial brokers and investors alike. Prospecting Prospecting is an essential component of building a results-oriented career. This class presents the strategies and techniques, used by commercial brokers, to build a lucrative client base. Students are taught how to systemize lead generation efforts and are provided scripts, follow-up techniques, and “secrets” to getting results. Marketing A lesson in utilizing both traditional and innovative techniques to generate leads and contacts. This class teaches the methods of drafting the most effective direct mail letters and discusses the emergence of technology and social media to reach a wider audience. The Procuring Agent (Tenant Representation) The fundamentals of representing the commercial tenant – probing, qualifying and handling the decision making process of the client; researching available space, drafting LOI’s, negotiating with landlords, and understanding lease documents. Marketplace Research A professional commercial broker is expected to know current market conditions. This class teaches the methods used in market research, and provides the tools and resources for obtaining information. Analyzing Return On Investments Presenting investment opportunities to a client demonstrates the broker’s ability to identify a “good deal.” This class teaches how to break down a commercial property by plugging in the factors that determine its value and return. Getting into the mind of investors – why they invest and what they invest in; the psychology of influence and sales – why an investor says “yes” to a property – it’s all about the return. This class discusses the importance of cap rate, understanding cash flow, estimating income and expenses, appraised value, evaluation and price. The objective is to teach the steps of determining a good investment before it is presented to the client, thus establishing a more knowledgeable and reliable service. A.I.R. Contracts This class introduces the contracts used by commercial brokers. It provides an understanding of which types of contracts to use for specific properties and their application to the transaction. Trainees are walked through the documents with an explanation of each section and their content. The Commercial Listing Agent The process and responsibilities of listing a commercial property – where to find listing opportunities, keys to a great presentation, pricing and marketing commercial properties, using the right listing contract and maintaining flow throughout the process. The Commercial Escrow Commercial transactions are oftentimes BIG deals that may present certain obstacles. This class teaches the steps and process of the commercial escrow, along with the skills and strategies to negotiate effectively, and the roles of the people involved. You will learn how to work through objections, apply strong work ethic, persistence and an increased level of commitment to get the deal closed. Commercial Dirt Brokering land and industrial properties involve technicalities the agent needs be aware of in order to reach a successful closing. This class presents the knowledge required when handling these types of transactions. Commercial Financing and 1031 Exchange Financing – This class provides an understanding of commercial financing and the different requirements that factor in to specific types of commercial properties. Agents learn why some properties are easily financed while others are not. Financing solutions are discussed as well as terms, programs and products to be aware of. Course Overview This class reviews the previous 15 classes. This is a question and answer session in which agents are provided an opportunity to discuss issues and obstacles and obtain expert consultation from a panel of professional brokers. Statistics show that over 80% of new agents will not remain in the business five years from now. Why? Most real estate offices do not provide their agents with sufficient training. As a brokerage, MGR Real Estate places a strong emphasis on providing new and experienced agents with thorough, ongoing training. We pride ourselves in our long-term associates who continue to succeed and prosper in this challenging and competitive industry. As a member of our team, you too, will receive the foundation, guidance and support necessary for a successful, long-term career. The Residential Purchase Agreement Home buyers expect professionalism from their Realtor. This class teaches the fundamentals of the C.A.R. Residential Purchase Agreement. Trainees are walked through the contract giving them a thorough understanding each section and enabling them to become familiarized with real estate terms. Due to current market trends and activity, a special focus is given to short sales and REO purchase agreements. All About Title “Title Advantage” Title insurance is an important element of purchasing real estate. This class teaches the role and function of title insurance and why the buyer needs it. The class also presents tools and resources for the real estate agent to assist in improving the flow of business. The Residential Listing Agreement The C.A.R. Residential Listing Agreement specifies the terms, of selling the property, to the seller and buyer’s agent, thus knowing how to thoroughly and accurately complete the contract is essential. This class teaches the fundamentals of the C.A.R. Residential Listing Agreement. Trainees are walked through the contract giving them a thorough understanding each section and enabling them to become familiarized with real estate terms. Due to current market trends and activity, a special focus is given to short sales listings. Up Book and Floortime – Converting Callers Into Clients One of the easiest and most effective methods of acquiring leads is to work “floor time.” MGR floor time is a 4-hour shift in which the agent answers “up calls” (phone call inquiries), providing them opportunities to convert callers into clients. Results require special skills. This class teaches the techniques to effectively convert a caller into an actual client. Proven methods and scripts are presented as well as etiquette and general procedures. Disclosures and File Tracking The flow of a real estate transaction depends largely on the agent’s file tracking and maintenance. This class discusses the responsibilities in maintaining a sales file that is complete and timely. It reviews the flow-sheet, checklist and disclosures required by the DRE as well office-specific disclosures required by the broker. The objective of this class is to inform the agent of all required steps, procedures, and documents to ensure a timely closing for the client. How to Show Property There is a skill in showing property. Agents who lack the skill end up uneccessarily showing numerous properties resulting in inefficient use of the client’s and the agent’s time. This class teaches how to research and present only the properties that closely match the client’s criteria. It teaches the methods of pursuavsively showing features or presenting switch properties. The CMA (Comparable Market Analysis) When pursuing a listing, the agent must know how to compose a CMA that presents current market data. This is an effective tool to demonstrate the agent’s professionalism and capability. An excellent CMA will oftentimes lead to a contract. This class teaches the tools to compose a CMA and reviews the contents that are required within. All About Open Houses Much like showing property, doing an open house involves certain skills in order to achieve desired results. Open houses serve 3 main purposes – 1) It performs a basic service to your client, 2) It exposes the property to potential buyers, and 3) It generates leads!! This class teaches the art of doing an open house so that the agent’s time and efforts are maximized. Mortgage and Financing One of the professional requirements of a Realtor is being educated on mortgage financing. This class brings in industry experts to educate agents on how to properly guide both buyers and sellers on the relative merits of the three or four primary methods of financing, including costs, and identifying which method meets the requirements or abilities of the client. The MLS (Multiple Listing Service) An important tool of the industry is the Mul;tiple Listing Service. Taught by the Board of Realtors, this class discusses the purpose of the MLS and its many uses.